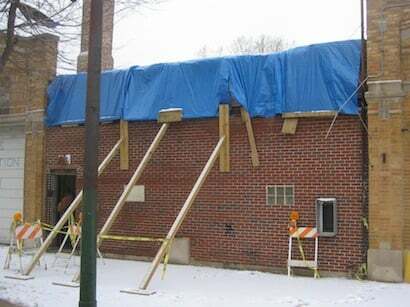 The owner of this South Side car detailing business paid over $2200 to have a "carpenter" install emergency shoring to her severely deflected brick facade. Within a week, the wooden supports had popped, shifted and were useless (see photo). AAA-1 Masonry & Tuckpointing installed heavy-duty vinyl tarps in only a few hours and for a small fee. Three years later, they are still protecting the interior space from water damage. AAA-1 Masonry & Tuckpointing has experience installing shoring and overwinter protection that lasts and lasts.